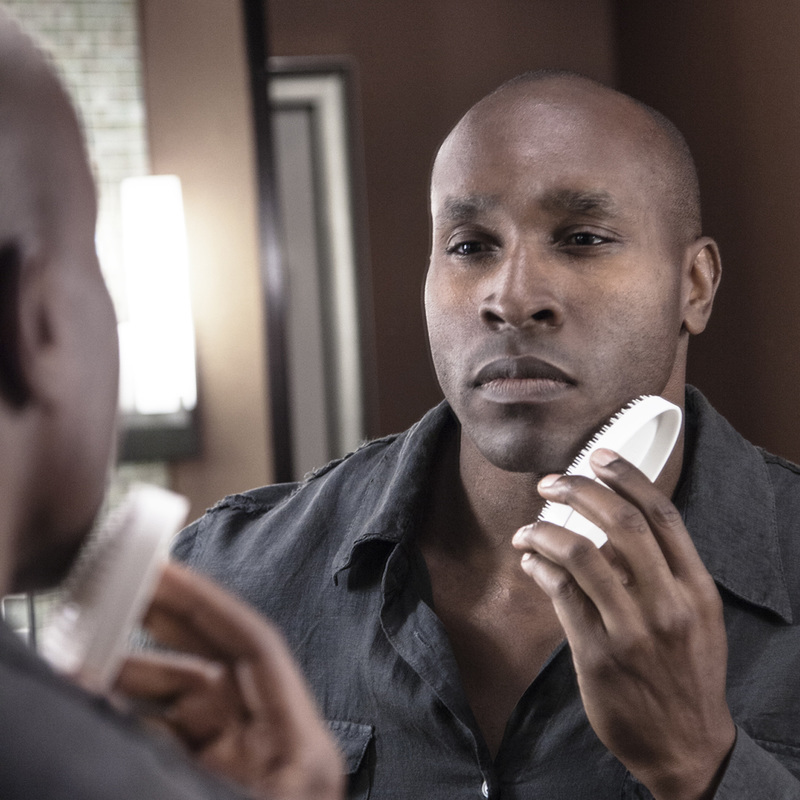 "My face used to be mad BUMPY between shaves. 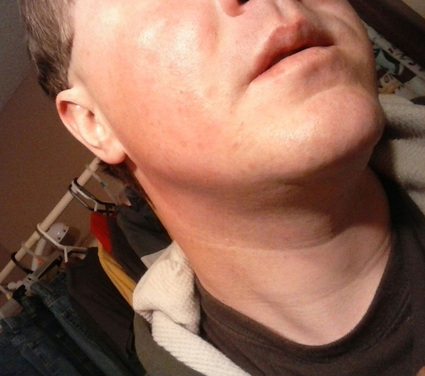 As the stubble came in so did the painful razor bumps; the left side of my face was especially bad. I bought this cream a while back that I used consistently for several years. The best it did was keep the condition from getting any worse, but the razor bumps persisted. My good friend told me about this new product called The Wizker! I was told I would be amazed by the results. When I got it home, I opened the box and my immediate reaction was '..that's it?! This little plastic brush looking thing?!' I shook the box thinking some special oil, cream or other items would fall out...nothing did. I read the instructions and followed them carefully. Within the first WEEK of use, I noticed a huge difference. The results have more than amazed me. The razor bumps are gone and my face remains smooth between shaves! All this from such a simple and easy to use product! I try to use it daily as part of my morning routine. After I brush my teeth, I brush my FACE, LOL! As long as you're consistent in using it, you will have a great outcome!" Clark: I'm a Marine. I have to shave everyday man. No exemptions. WIZKER: What else you have tried before the WIZKER? Clark: Tend skin, bump patrol, bump stopper, this other stuff that comes in a white bottle with an eagle or falcon on it. It smells funny. WIZKER: And did the Wizker work for you? Clark: The product works man. I'm very pleased. I think it's just my skin. I'm pretty white and I have sensitive skin. WIZKER: What's your shaving routine? Clark: I use the Fusion Progluide. It's the best for my skin. Single blade razors irritate my skin. The bumps are virtually gone. Your product is the only thing that had worked for me. WIZKER: How has the Wizker changed your life? 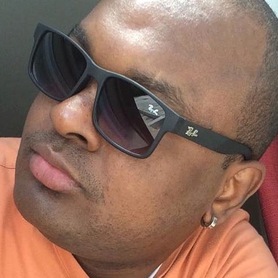 Clark: Your product works because I'm able to get skin fade haircuts with a Norelco or razor blade and I use the Wizker and it hasn't failed me yet. Which is something I've never been able to do. [I'm] getting better results by "wizking" left to right. I also found that using the Wizker while in the shower works better for me! You have an amazing product! "I'm liking the Wizker. By now I usually am bumping out badly or having a bad case of razor rash/burn. I've told some of my guys and they wanna give it a go. AMAZING RESULTS FROM THE "ZERO RAZOR BUMP CHALLENGE" AS SEEN ON YOUTUBE! LIKE THESE PEOPLE, YOU WILL FALL IN LOVE WITH YOUR NEW WIZKER! "This brush will definitely work to combat those difficult embedded hairs. Warm shower and following the use directions will make it an easy daily chore." "Product seems to be helping with my bumps under my chin, not as good behind my neck, but I only been using the products about 3 weeks." 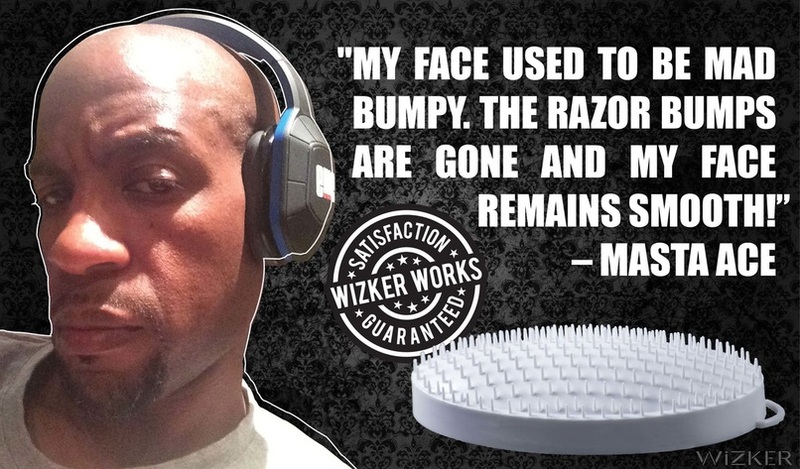 "Got my wizker Monday afternoon...used it Monday evening and Tuesday evening, and the change is AWESOME, bumps like 95% gone, and the remaining are tiny. Gonna use again in the morning, this is great. Thanks again!!" "Booooooi that thang working!!! I had bumps bad and already seeing improvements far beyond what I expected!" "the brush is working great!" 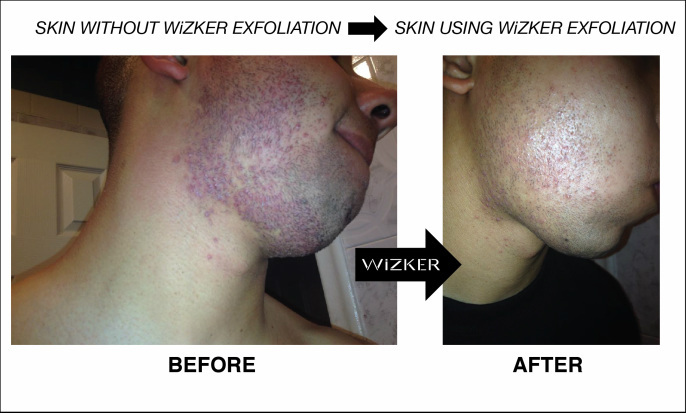 "The Wizker seems like a unique product, offering what other exfoliating products lack." "I've already started using the Wizker for beard taming..seems to be working!" "I use it 1-3 times a day, almost as a comb. The real effect is at skin level though, it's quite soothing to essentially scrub my face though a thick beard. My skin genuinely feels better after I do it, like giving your head a good combing after wearing a hat all day." "My progress with the Wizker is going very well. I can see the change on my cheek bone. Thank you!" "I am very thankful to have found this product. My situation was a little worse than the average but things are improving nonetheless! I use it twice a day usually after the shower or on the way home from work. Thankful for a daily exfoliator!" "I ain't had a cut since I bought the Wizker and man this is the smoothest the back of my head has felt in a very long time!" "This item arrived early, which I loved. I have used it for a few days and love how smooth it makes my skin." "Wow. You are my hero bro. I have used all (Literally all) the chemicals on the market. Nothing work. But your stuff men instantaneous result. I have been plagued for more than a decade. That is it. My men. Big appreciation men. You are my Messiah. God bless you." "Razor bumps in my bikini zone was one of the challenges I had to face not long ago. It looked ugly, caused me discomfort and in some cases even pain. That was the moment when I received my Wizker. It's a small, very simple and easy to use brush with thin bristles. I've heard that it works like a magic, once you use it the razor bumps are gone immediately. It sounds more than amazing but it's hard to believe. Well.... Believe it or not magic happened! I used it after a shower, brushed the skin in the direction of hair growth. That's all. Simple like that. 5 minutes later, I went out of the bathroom, I took a look at my problematic bikini zone skin, and I was shocked! The bumps were gone. I've never experienced such quick results after a problem with my skin like that. The Wizker has become a part of my daily health and beauty routine and is important to me in the same way like the soap and the toothbrush. I use it everyday for prevention. Thank you Wizker Man for that magic!" – Petra S.
"Had the luck of testing out the Wizker - couldn't believe the results. As a curious mind, I had to A/B test it - and it totally did the job. After one use the ingrown hair on one side (I'll not mention the area) went away yet the other side kept growing into a big mess (now, weeks later the first area is totally smooth and scar free, and the other still has the annoying bump). The Wizker was quick, simple, and hassle-free!" – Julia M.
WIZKER: Prior to buying the Wizker, what else you have used to treat/prevent razor bumps & ingrown hairs? Michael: I tried just about every ingrown product on the market with no improvements. I also went to a dermatologist and was prescribed benzoyl peroxide. I had little success and it dried my skin out bad. Michael: The Wizker brush changed my life. In one week of using the Wizker, I’m nearly bump and ingrown hair free. Michael: My shaving routine now is twice a week with a vintage double edge razor. In the future I plan on shaving every other day when my skin continues to progress from using the Wizker. 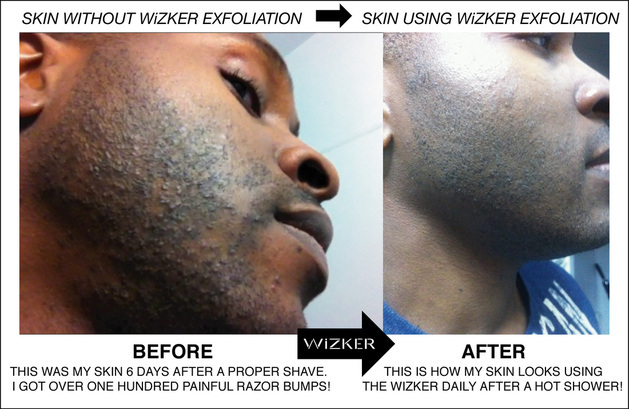 WIZKER: How has the Wizker helped your skin? Michael: Personally I like using the Wizker after I shower but I dry my face first. 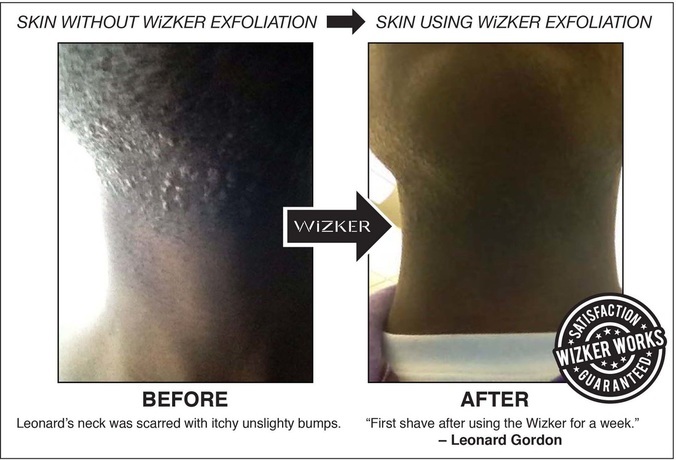 In my opinion, the Wizker exfoliates and lifts the ingrown hairs better on dry skin, but you should prep the skin with a hot towel or a shower and then dry the face. The warm water opens the pores and the ingrown hair will lift out easier with the Wizker. I’m looking forward to my future progress using the Wizker. I thank God for giving you the knowledge on making this brush! Everyone is switching to the Wizker! It's the chemical brands who don't want you to own a Wizker because they know the secret wonder of exfoliation! Exfoliating is an ancient skin care practice that dates back thousands of years. Your skin deserves better. 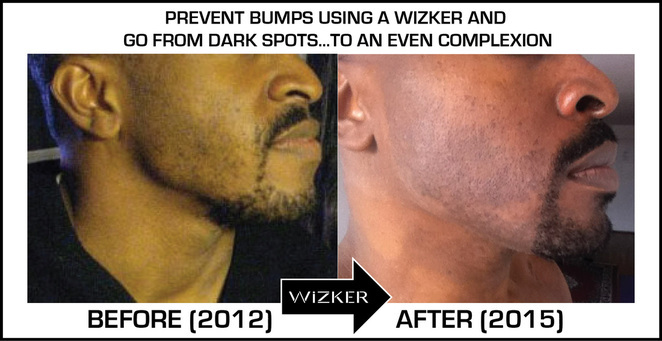 Don't just "reduce" bumps – end razor bumps with the Wizker, guaranteed. Try one risk-free!